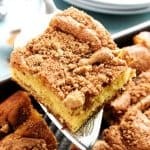 Made with 7 simple ingredients this BEST EVER COFFEE CAKE is a traditional yellow cake, with a classic cinnamon & brown sugar swirl and topping. I call this Best Ever Coffee Cake, Shelia’s Coffee Cake and that is because my mom’s dear friend Shelia made it for us all the time and gave my mom the recipe. I had the best childhood and many of those memories were with my parents dearest friends: Augustine’s, Vilhauer’s and Gotschall’s. We were all like family. Shelia Augustine was a gem & on top of that she made the best sweet treats EVER! Every camping trip was adorned with her goodies, half of the reason I loved going. But the most coveted recipe of hers was her coffee cake. 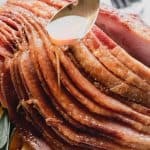 From the taste of it one would have assumed she worked on it for hours, slaving away in the kitchen till the wee hours of the night making this delicious treat. Oh were we wrong! 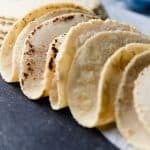 Shelia gave the recipe to my mom and we were shocked to find out how simple and easy it was. 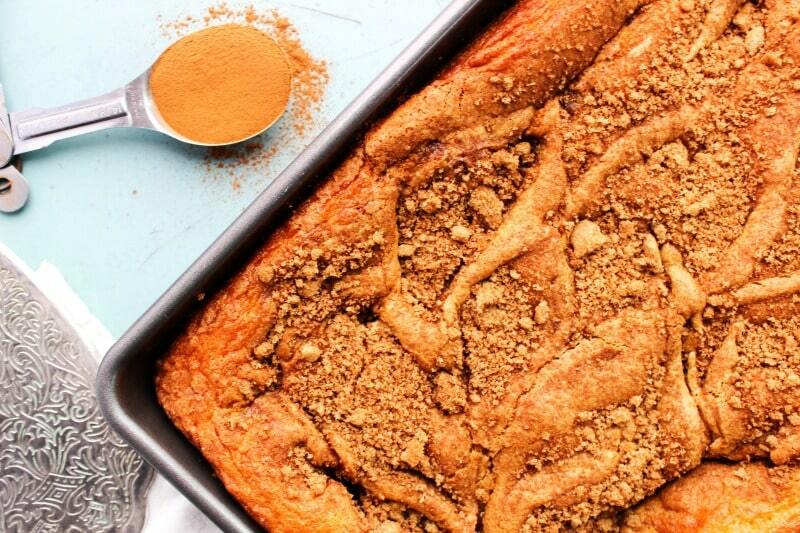 7 simple ingredients and you are on your way to coffee cake perfection. Anytime I give this Best Ever Coffee Cake to a friend or neighbor, they always, and yes, I mean always say, “this is the best ever coffee cake” or “I never knew coffee cake was this good”. I have given away the recipe more times than I remember. This Best Ever Coffee Cake will be known to the masses thanks to Shelia and her willingness to always share her amazing recipes. Although Shelia is no longer with us today. Her love and laughter will never be forgotten and her recipes passed on for generations. Love & miss you Shelia. 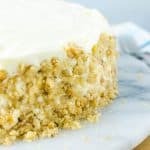 Would you like to enjoy some more coffee cake recipes be sure to check these out: Maple Pecan Coffee Cake ,Copycat Starbucks Coffee Cake or a fun twist on “coffee cake” Coffee Cream Cake. How do you make coffee cake? Preheat oven to 350; grease 9×13 metal pan. Mix all the ingredients for the cake in a mixer for 7 minutes. Meanwhile, mix together brown sugar and cinnamon in a bowl. Once the cake is done mixing for 7 minutes, pour half of the batter in the greased 9×13 metal pan. Sprinkle ½ of the brown sugar mix over the cake in the pan. Pour the remaining batter on and sprinkle with remaining sugar. Place in oven and bake 25-35 minutes. Or until the cake is set and is pulling away from the edges. Let it cool completely so it doesn’t crumble when you cut and serve. What to eat or drink with coffee cake? 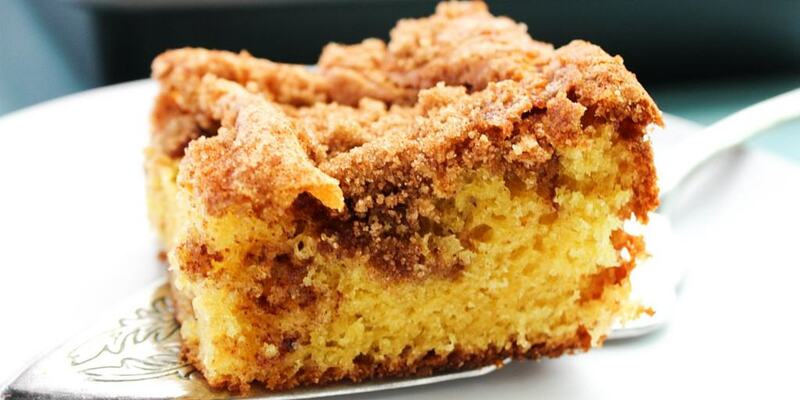 I love having a slice of coffee cake for or with breakfast! A personal favorite is a hot cup of tea and a slice of cake on a cold winter morning! 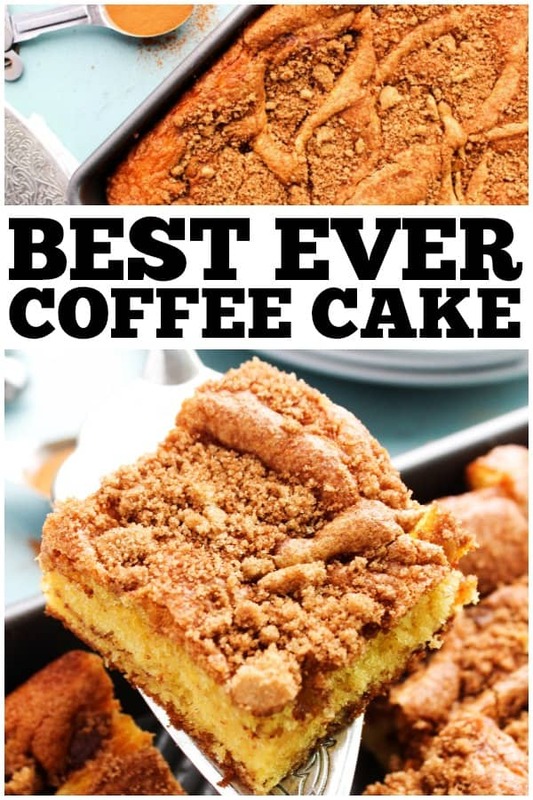 My favorite kitchen items I used to make this BEST EVER COFFEE CAKE. KITCHENAID MIXER: I love my Kitchenaid mixer and use it almost daily. 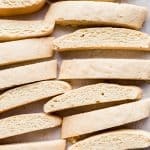 For cookies, breads, sauces, frostings and dough – I find many recipes that I can use my KitchenAid to reduce prep time. I have two that I couldn’t live without. I use this for my coffee cake because it takes 7 minutes to mix – and I can do other things, while my KitchenAid works it magic. 1 yellow cake mix I like Duncan Hines Just use the mix, don’t not follow the directions on the back! Preheat oven to 350; grease 9x13 metal pan. Mix all the ingredients for the cake in a mixer for 7 minutes (this is key to make the pudding set). I love to use my Kitchen Aid mixer for this! Once the cake is done mixing for 7 minutes, pour half of the batter in the greased 9x13 metal pan. Sprinkle ½ of the brown sugar mix over the cake in the pan. Place in oven and bake 25-35 minutes. Or until the cake is set and is pulling away from the edges. Let it completely cool so it does crumble when you cut and serve it. This sounds so good! And I personally like that it uses a cake mix because, well, it’s easier!!!! I can’t wait to try it out. Also Pinning! 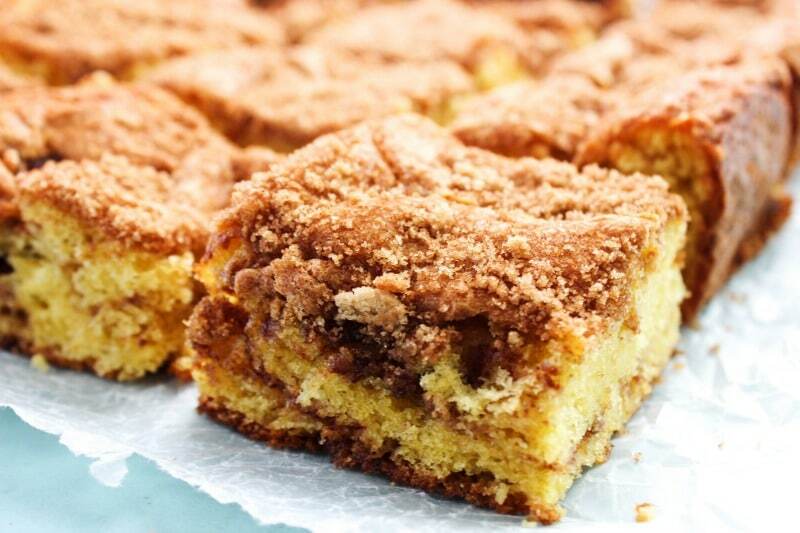 I grew up eating coffee cake at least once a week! Love it! Hi Sandra! 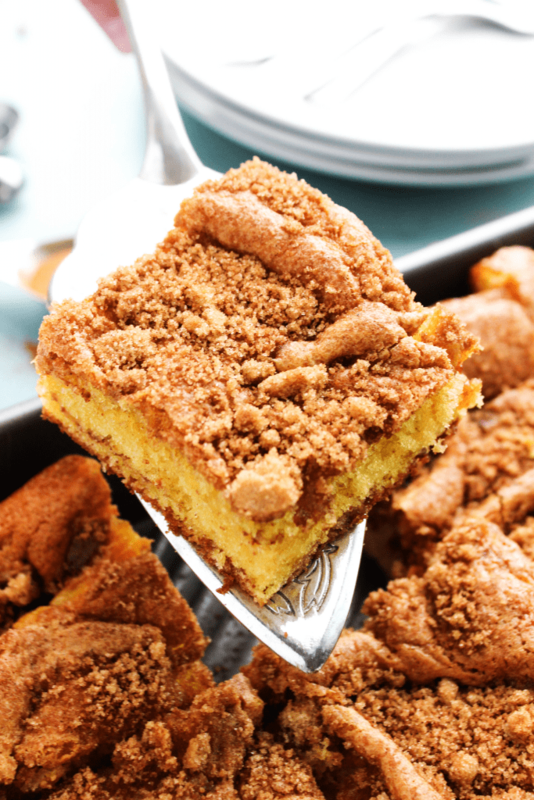 We just love coffee cake and this sounds easy and delicious! Thanks for sharing your recipe. Pinning! Hope you have a happy evening! I love a good coffee cake! Thanks for sharing! I love a good coffee cake recipe! Thanks for sharing 🙂 Pinned while I was here tonight! Sheila would have loved seeing this posted! I just ran across this post. What a beautiful tribute to my sister. Still miss her every day so thank you for an unexpected smile. Going to check out the other post above also. Is this what you sent me? This was . . . just wow! thanks for sharing this! It looks super easy which is what I love. 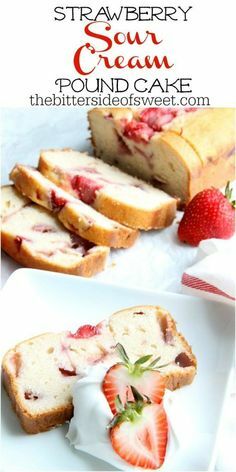 I will have to make this for a brunch sometime! Do you actually make the pudding and put them in the cake or do you just use the powder? One thing it doesn’t say, is if the pudding is added dry or wet. Love how super easy this it to make using a cake mix! It really does make it easier. Enjoy! Coffee cake is such a Saturday tradition in our house. Can’t wait to try this! I am such a sucker for that crumb topping! I love how easily this comes together! 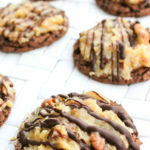 It is the perfect treat for breakfast! Enjoy! 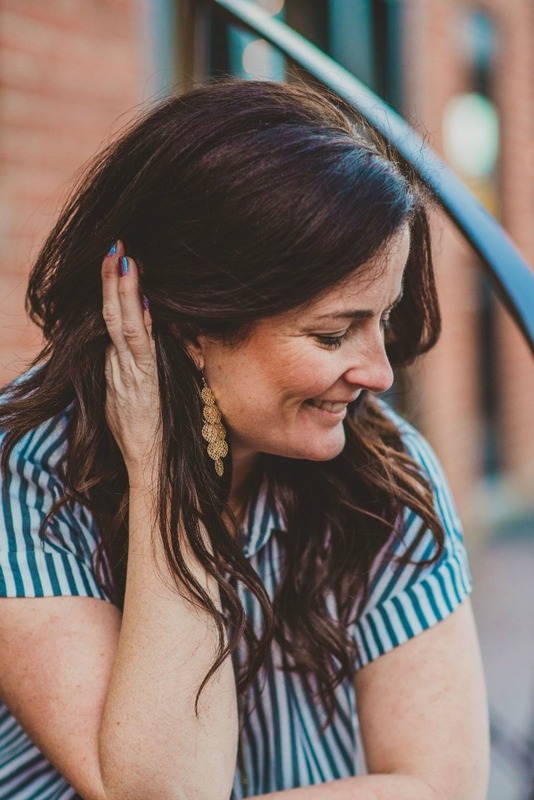 Two questions – does this freeze well? And when I made it, the first layer of brown sugar mixture kind of came to the top. Should I swirl that in? It was absolutely delicious, though! I will be making it again (and again)!! I haven’t tried freezing this exact coffee cake, but I’m sure it would! Be sure to wrap it tightly and then store in a air tight container. It should keep for a couple months at least. Definitely try swirling it in if it was a problem! I’m so glad you liked it! 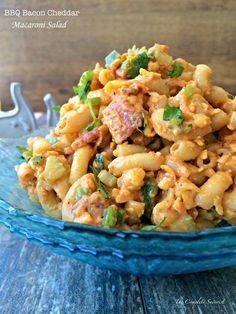 Another must make! Anything with coffee works for me! This. I NEED this in my life! Everyone does!!! I hope you enjoy! i really just want a big cup of coffee with this! YUM! What about add milk adding not water to the cake mix? 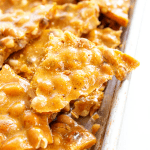 You can definitely use milk in place of water in this recipe! I hope you enjoy. When to swirl brown sugar and cinnamon in to the cake? You don’t have to swirl it in, it sinks a little when baking, but you can swirl after each layer if you would like! How much milk to add to the coffee cake mix? You can replace the full 3/4 cup of water with milk, it will make it more spongy.